Some say that the original Feng Shui philosophy was based on topographical features of the land. Ancient shamans would "read" the land and look for important clues as to which areas would be most beneficial to place a home or village. This "theory" has developed into what we now call "Form School." Still utilized today, in fact all types of Feng Shui use Form as it's foundation, helps us to orient spaces based on the natural flow of energy. Using the sun as a guide, Form gives us basic guidelines as to how our homes can be best supported in the environment. The placement of a home or village is ideal when there is protection from the winds on three sides. The "black tortoise" serves as the rear protector. It's a large mountain or mountain range behind the structure. 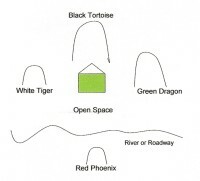 When viewing the property from the front, the "green dragon" hills are to the right and the "white tiger" hills are to the left. These hills provide further protection and security. The green dragon hills represent yang, male energy and should be higher than the white tiger. Why? The reason is in the orientation. The Chinese typically oriented their homes facing south to get maximum benefit from solar gain. The green dragon, therefore, would be to the east, where the sun rises. The energy of the sunrise is much more yang and life-enhancing than the sunset (in the west, which is yin/feminine energy). There should be an open expanse to the front of the property and a water or roadway to carry the chi (aka opportunities) to the property. The "red phoenix" is another hill that is a bit further away in the front of the property. The home or village is nestled in between these topographic features being supported by the hills, nourished by the water/road and everything is held together in a contained, yet open system. Most of us are not in rural areas, so how does this structure work in urban/suburban environments? Very simple. Just substitute the mountains and hills for buildings and trees.